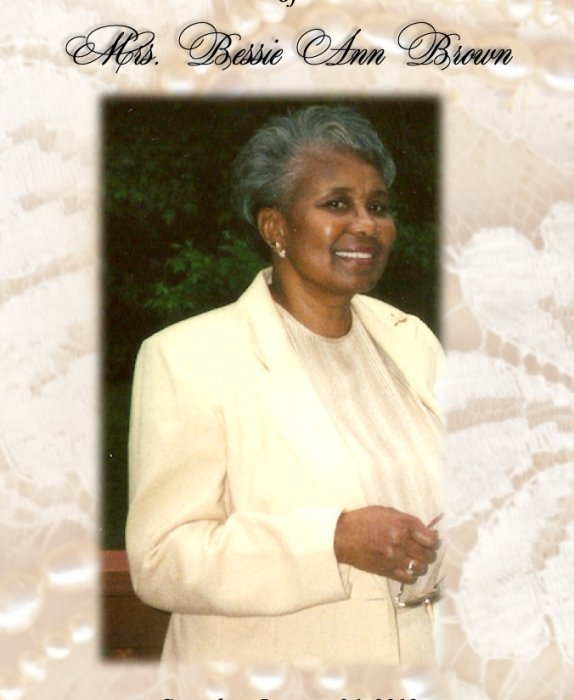 Obituary for Mrs. Bessie Ann (Brown) Brown | Mack Eppinger & Sons Funeral Service, Inc.
Mrs. Bessie Ann Brown, 80 of Cartersville, Georgia formerly of Baltimore, Maryland passed away on Wednesday, January 16, 2019. Funeral service will be held on Saturday, January 26, 2019 at 11:30 am at Mack Eppinger and Sons Funeral Home Chapel, 210 North Bartow Street, Cartersville, GA 30120. Interment will follow at a later date in Baltimore, Maryland. Bessie was born in Richmond, Virginia on March 12, 1938 to Sydney Brown and Mary Shepherdson Brown. She lived the majority of her life in Baltimore, Maryland where she graduated from Dunbar High School. She them went on to be an administrator for the Maryland State Department of Education. Bessie later retired from Morgan State University and subsequently relocated to Cartersville, Georgia. Bessie attended several churches while living in Cartersville, Centennial United Methodist Church, Mt. Pleasant Church and Mt. Olive Baptist Church. Bessie Ann Brown was a strong faithful soldier for the Lord, who lived a long, beautiful life, loving her family. She leaves to cherish her memories, a loving husband of sixty years, Vernon Brown; sister, Alice Hamlett; brother, James Brown; son, Maurice Brown (Phyllis) and daughter, Charlene Brown; grandchildren, Channell Swain (Chebito), Troy Dottory, Kristen Brown and Maurice Brown,Jr. ; great-grandchildren, Brittany Garnigan and Eric Russell; great-great-grandchildren, Jackson Garnigan and Erika Russell, and a host of other nieces, nephews, relatives and friends. Your life was a blessing. Your memory a treasure. You are loved beyond words and missed beyond measure!